A new program that helps low-income families stretch their food dollars and buy local, too, promises nourishment for urban and rural areas. One indicator is the crowd of mayors and city council members from around metropolitan Kansas City at a recent media event featuring results from the pilot Double Up Food Bucks program at four area supermarkets. They came to see what the privately funded match of federal nutrition assistance dollars at grocery stores could do for both people and places. A popular incentive for low-income shoppers at farmers markets is moving into grocery stores. The expansion has the potential to strengthen urban and rural redevelopment efforts with benefits to shoppers, farmers, and local commerce. Plug into the Double Up Food Bucks national network. Also check out the September 24, 2015 National Good Food Network webinar on Leveraging Health Care Funding. Health-related investments often back the match dollars involved in the incentive programs. Around 5,000 low-income shoppers used the program from its June launch through August. They spent nearly $30,000 on produce, mostly from smaller scale farmers in the region. “This is economic development,” said Mark Holland, mayor of the Unified Government of Wyandotte County, Kansas, which is home to Kansas City, Kansas. “It benefits the farmers selling local produce. It helps people who need it most to stretch their food dollars. It also benefits grocery stores; it brings people into the store,” he said. 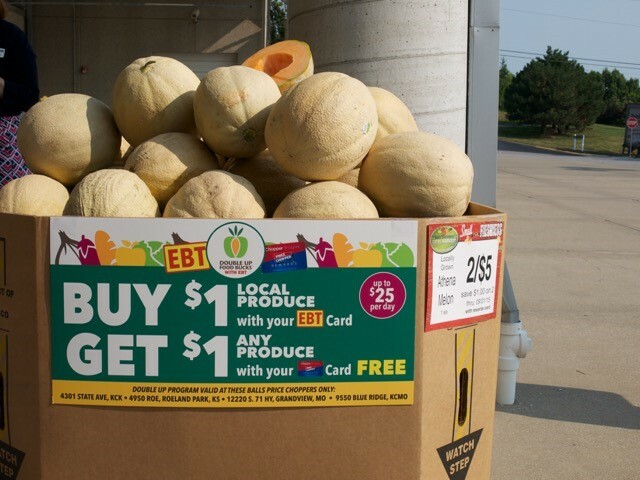 Shoppers who use Supplemental Nutrition Assistance Program (SNAP, or food stamp) benefits earn a dollar-for-dollar match on their Price Chopper loyalty cards when they buy up to $25 a day of locally produced fruits and vegetables. They can then use the extra money to buy more of any produce, doubling the amount of healthy food they take home. “It was a natural for us,” said Mike Beal, chief operating officer for Balls Food Stores, a regional family-owned chain with 15 Price Chopper and 11 Hen House supermarkets in the metro area. Farmer Brent Brashears said the program helps more people buy his lettuce, which is on grocery shelves the day after harvest. His farm has added one greenhouse and two employees in the last year since it started selling through Good Natured Family Farms. Diana Endicott, president of Good Natured Family Farms, said the group’s produce sales are up 20 to 30 percent at the four Double Up Food Bucks test stores since the pilot started. “Having the local food component in the incentive is key,” said Noah Fulmer, program director for the Double Up Food Bucks national network. “Each dollar is then working twice as hard,” he said. “It’s not just increasing the affordability of healthy food but also building the regional supply chain for that food.” This reinforces the work that Good Natured Family Farms and others are doing to link local producers with larger buyers like grocery stores. Double Up Food Bucks and other SNAP incentive programs have proven the three-way win – shoppers, farmers, and local commerce – at farmers markets across the country. Their results built bipartisan support in the 2014 federal Farm Bill for a provision that puts $100 million into advancing such programs. The Fair Food Network, a Michigan-based nonprofit, launched Double Up Food Bucks in 2009 at five Detroit farmers’ markets. It soon expanded statewide to more than 150 sites. Double Up shoppers in Michigan are eating better: 87 percent report eating more fresh produce, and 66 percent report eating less junk food. Farmers are benefiting, too. Combined SNAP and Double Up sales since 2009 at Michigan farmers’ markets have put more than $7 million into the state’s farm economy. Now some SNAP incentive programs, like Double Up Food Bucks, are moving into retail grocery stores, where people buy most of their food. The Fair Food Network began testing Double Up Food Bucks at grocery stores in 2013 with initial locations in Detroit. Kansas City is the next stop on the program development journey. The expansion is possible because private funders that have supported SNAP incentives from the start are ready, willing, and growing in number. Match money comes from private and public organizations that are working to improve community food choices and generate social, health, and economic returns. Examples are hospitals and insurance companies, Main Street organizations, and social investors and philanthropies. “Local governments are also using economic and community development resources for incentive programs because they can help make markets viable in communities that need revitalization,” Double Up’s Noah Fulmer said. Wyandotte County mayor Mark Holland is interested. A grocery store is part of his redevelopment plan for Kansas City, Kansas, the county’s center city and the third largest in the Kansas City metro area. It is also perhaps the most challenged. In 2009, for example, Wyandotte County ranked last in Kansas on a range of health measures from chronic disease rates to socio-economic factors such as unemployment and children in poverty. Mayor Holland has championed a Downtown Healthy Campus Plan. It builds on development momentum getting underway, a new transit center, and research that points to a section of the city’s historic downtown as a prime grocery store location. Negotiations are underway for a supermarket to serve existing residents who have no nearby full-service options. It would also serve newcomers attracted to this urban area at the confluence of the Missouri and Kansas rivers.